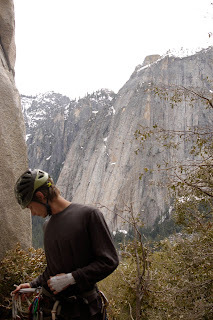 Got up to Yosemite last weekend for some last chance climbing in the valley before winter really settles in. It was such a beautiful time to be there: the sun was out, the temps were climbable (probably hovering around 40 degrees during the day) and it felt like we were the only people in the park. The main event was climbing "Snake Dike" (5.7 R), the notoriously run-out route to the top of Half Dome, Yosemite's most iconic formation. We woke up at 5am, had breakfast, packed up and quickly got going on the 6-mile approach to the base of the route. We passed waterfalls and enjoyed some stunning views along the way--I was so happy to be in the valley again. After only minimal trial-finding delays, we made it to the base of the route around 10:30am. 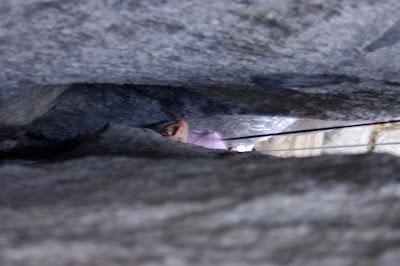 I admit I started feeling intimidated by the climb once we started racking up to get going--I can't say that I particularly enjoy long run-outs, and on this route there is up to 75 feet between bolts. But once I saw how easy the climbing was (the super long run-outs are mostly 5.4) and felt the solid granite, I relaxed and enjoyed it for the adventure that it is. 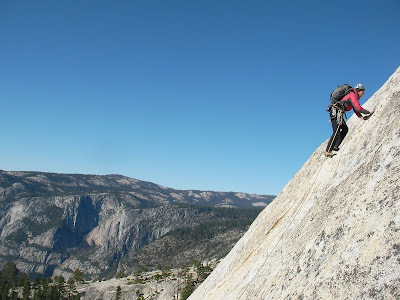 My calves were burning after the long hike and eight pitches of friction-y climbing, but at the top of the route we still had the "endless third-class slabs" to walk up to the summit. After the summit we descended down the other side and made the nine-mile hike back to camp. I was so ready for dinner and my sleeping bag by the time we made it back. 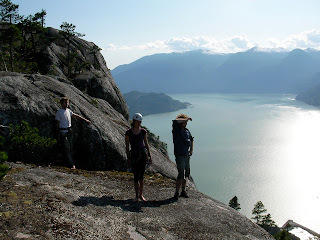 After all of the easy, poorly protected climbing on Snake Dike, we decided to climb something hard but well-protected the next day on our way out of the park. The perfect fit: top-roping "The Generator Crack", a heinous offwidth that can seemingly only be climbed through pure struggle, blood and bruises. It was a colder day, just around freezing, but we quickly warmed up through the physical effort. 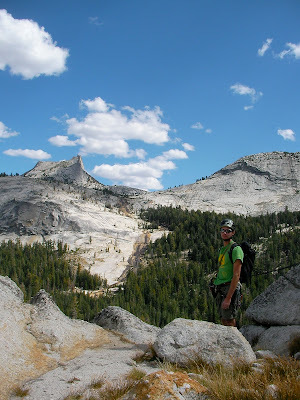 I started an internship with the Santa Cruz Weekly newspaper after the summer road trip. My first cover story came out today on Tibet: Murder in the Snow, a documentary that that relates to my past mountaineering experiences. It will be coming to Santa Cruz as part of the Pacific Rim Film Festival. I've pasted it below, or you can read it on the Santa Cruz Weekly's site here. Luis Benitez paused when he saw me coming down and leaned into the axe planted in the snow above him. “Good . . . tired,” I replied, my voice weak. “I’ll bet you are,” he said, and laughed. “Why don’t you go back to base camp, get yourself a coke, go to college, find a hot boyfriend—how ‘bout a junior—and forget this scene for a while,” he said. That was one of the first conversations I had coming down from the top of Everest in 2007. 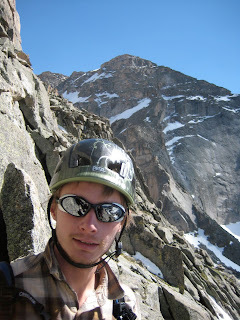 Benitez, an experienced guide, was headed up for his group’s own summit bid, what would be his sixth summit of the peak. 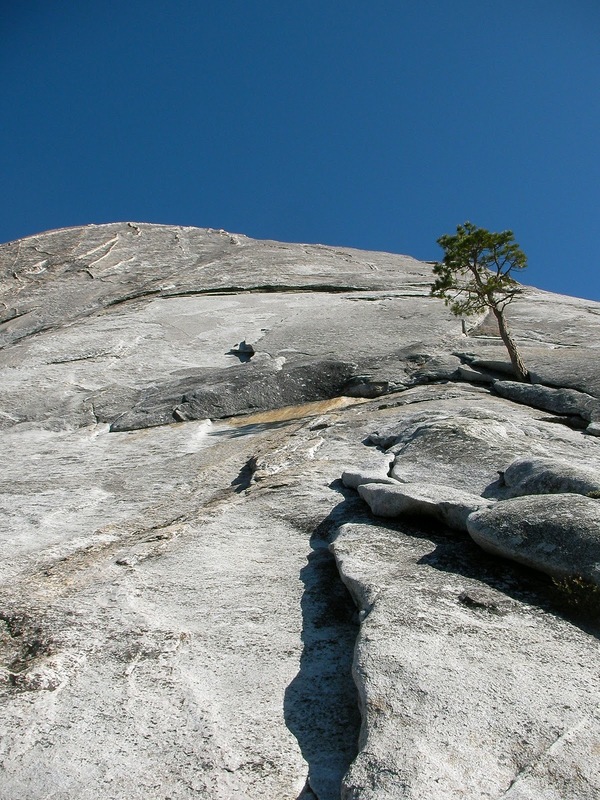 After our meeting he continued on to the top of the world, but once he got there, instead of the usual euphoria he felt something less pleasant. “I felt pretty disillusioned,” he told me over the phone a few days ago as he walked his dogs around his Colorado neighborhood. Benitez’s discomfiture stemmed from an event that had occurred about seven months before, while we were both on Cho Oyu, the 26,906-foot Himalayan giant 19 miles west of Everest. While I was high up on the mountain making my summit bid, Benitez was back at base camp, where he witnessed a tragic event unfold, an event recounted in the film Tibet: Murder in the Snow, which will screen Saturday, Oct. 15 at the Del Mar and feature a post-film discussion with Benitez. The film features first-hand footage taken by Romanian mountaineer Sergiu Matei. The Chinese border patrol had opened fire on about 70 Tibetans who were making an attempt to flee by way of the pass. Even with crude weaponry and aim, they managed to lodge a fatal bullet into the back of Kelsang Namtso, a 17-year-old nun hoping to escape into India in order to freely practice her religion and realize her dream of meeting the Dalai Lama. I didn’t hear about the incident until I returned to base camp, and even then I only heard a few scattered details. “There was a body on the pass, but don’t worry, it’s been cleaned up now,” I was told. It was only after I returned to the states that I realized the irony that while I, a 17-year-old Westerner, stood on the top of a mountain under which, by some Buddhist legends, the instructions on how to save the world from chaos are buried, Chinese officials prodded the lifeless body of a 17-year-old nun who had made a desperate attempt for a better life, taking photos with her body and the summit in the background. 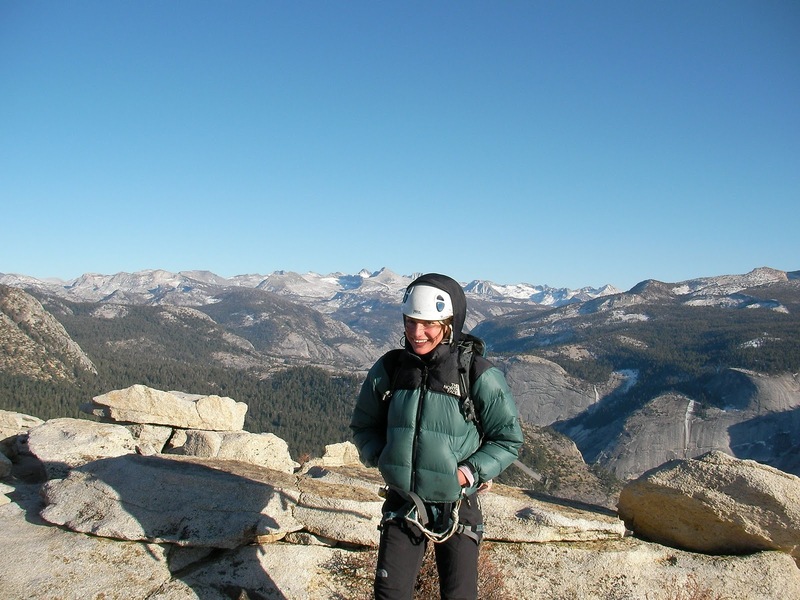 The event created a rift in the mountaineering community. Some of the guides, people from the Western world running a business for Western clients, didn’t want the information to get out for fear they wouldn’t be able to get permits to return the next year. The Chinese government, they reasoned, would have no reason to let climbers into the country in the future if it meant having witnesses who would report on incidents such as this one. Benitez says he was appalled when he learned that no one else planned to report the shooting. After he wrote an anonymous article for the website http://www.explorersweb.com, a couple of other guides found out and, Benitez says, “came down on my head for speaking out. It was a cussing and screaming match.” Then they told him that the Chinese government had his name, that he’d better get out of there. According to Benitez, the release of the event had the feared effect: it caused permitting and logistics to become much more difficult on Cho Oyu. He says the release of Green’s article in Men’s Journal, which denounced the climbers who chose to remain silent about the event, also fractured the mountaineering community—not just about whether to continue to fuel “summit fever,” the term invoked when mountaineers seemingly put their own glory ahead of helping their fellow man—but also over what would be the best course of action for the greatest number of people in Tibet. The net effect of publicizing the event is unclear. Benitez says the Chinese government “still calls it normal border management to this day.” What’s more, China built a new garrison port to catch refugees going over the pass. Attempts to get the incident recognized as a crime against humanity were stalled because it “was not a genocide,” says Benitez. But Benitez says filling in the knowledge void about China’s relationship with Tibet is still important. He equates the average Chinese person’s level of knowledge about the treatment of Tibetans to what residents of the 13 colonies were told about the Native Americans. “They’re told [by the government] that they’re bringing infrastructure, health care, religion—isn’t it great?” Benitez says. “They don’t hear about border shootings or mass killings due to religion. It’s all perspective. The past while has been largely characterized by rain and a bit by disappointment. We did have one clear day about a week ago, in which Matt and I decided to go for Sisyphus (the 22-pitch 5.10d sport climb up Ha Ling peak in Canmore). 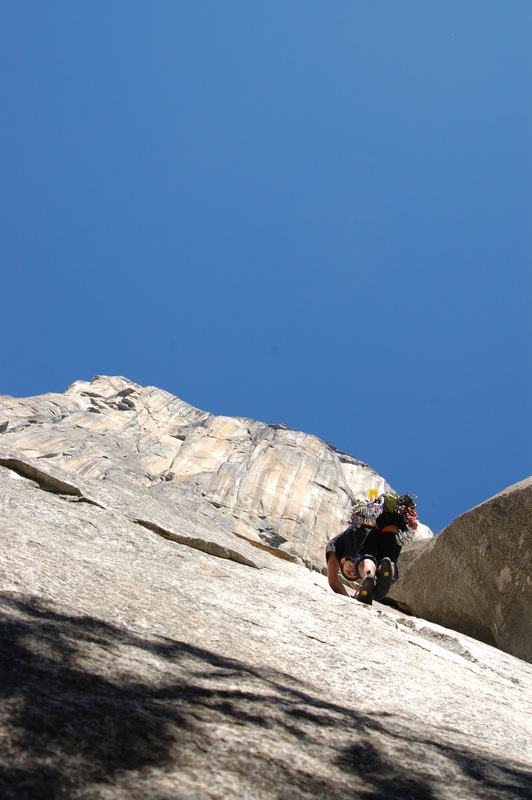 Matt was at the top of the third pitch, getting reading to belay me up, when I heard a loud fluttering and saw shadows whiz past. My first thought was that we were under an attack by some rather angry birds; I carried this thought so far as to think to myself that we should tell the guys at the climbing shop in town and ask if they knew if this was a common nesting site or something. But then I realized that I was in fact right in the middle of a shower of bowl-sized rocks—just protected by a small roof over my head. The rock-fall lasted about fifteen seconds. Matt and I didn’t say anything for a few more seconds afterward—I think we both paused in a split between kind of wanting to carry on but thinking that the wise thing to do would be to retreat. 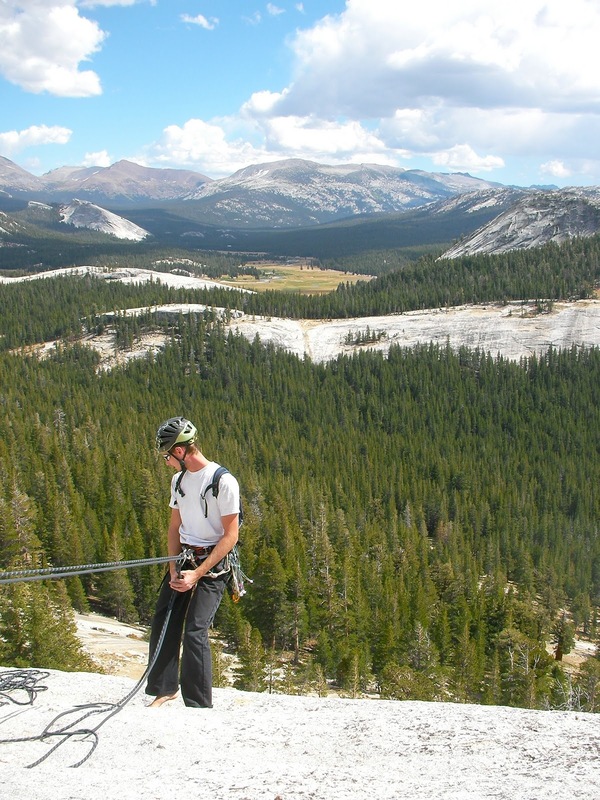 I called up to him and we decided to rappel back down. The next day we started to drive west. 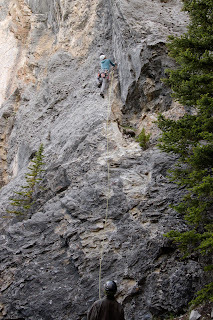 We made a stubborn attempt to climb at Lake Louise again in the not-so-good weather, and spent a few days just hanging out reading and playing cards. 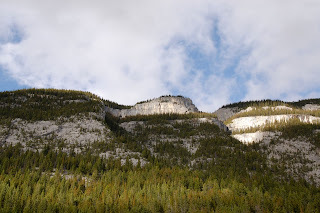 On Wednesday we did a hike to the Walcott Quarry at the Burgess Shale—one of the world’s best fossil sites, where even imprints from soft-bodied creatures from the Cambrian explosion (about 505 million years ago) can be found. It is an amazing place to witness the evidence of some of evolution’s early experiments. There wasn’t space on the tour for me to go into the quarry itself, but I found quite a few intact trilobites on the trail below it, where pieces of shale collect after sliding down the hill. After the hike, we continued our drive west . . . into Squamish, where we are now. Even though it had been raining here for the past two weeks here too, when we arrived we were welcomed by spots of blue showing through clouds that looked far friendlier than any we had seen for awhile. Looking at the Chief, the huge block of granite that is Squamish’s main attraction, made my hands start to sweat in anticipation of climbing again. Even though the rocks were still wet, we checked out some of the bouldering at the base of the chief as soon as we arrived. 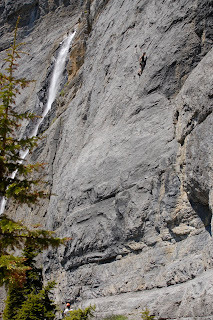 Yesterday we climbed some single-pitch cracks, then nearly dry. We drove through Montana and into Alberta in order to meet up with Nick on July 3. 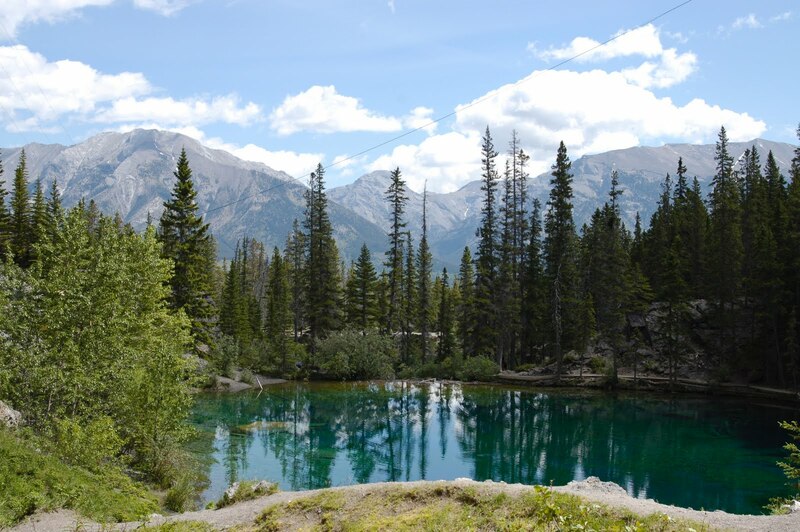 Right in the Canadian Rockies and just outside Banff National Park, Canmore is ideally situated for climbing—plus, we have the luxury of being able to stay in a house that belongs to friends of Nick’s family. Nick also brought some salmon, halibut, and lingcod that he just caught while on a fishing trip in British Columbia. Life is good. 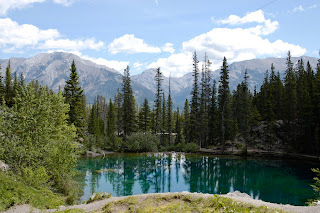 We spent our first two days here sport-climbing at Grassi Lakes. This area has several fun and scenic bolted walls; some right beside glacial lakes that are the color of the Caribbean Sea. Ha Ling Peak loomed above and we eyed up its route called “Sisyphus Summits”—with up to 21 pitches, the longest sport climb in Canada. I am feeling more confident now leading 5.10’s. 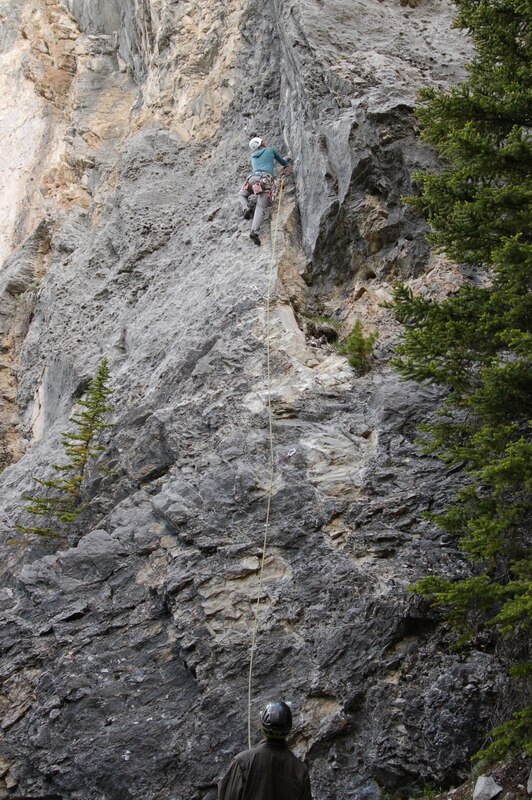 I think my favorite climb at Grassi Lakes was “Graceland” (5.10d), a steep and blocky route. Matt on the first pitch of "Velcro Highway"
Yesterday we went into Banff to the Borgeau Slabs to climb some multi-pitch sport routes. 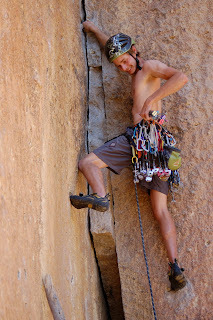 Matt and Matt climbed “Velcro Highway” (5.11a), while Nick and I climbed the four-pitch route “Walk of Ages” (5.10b). 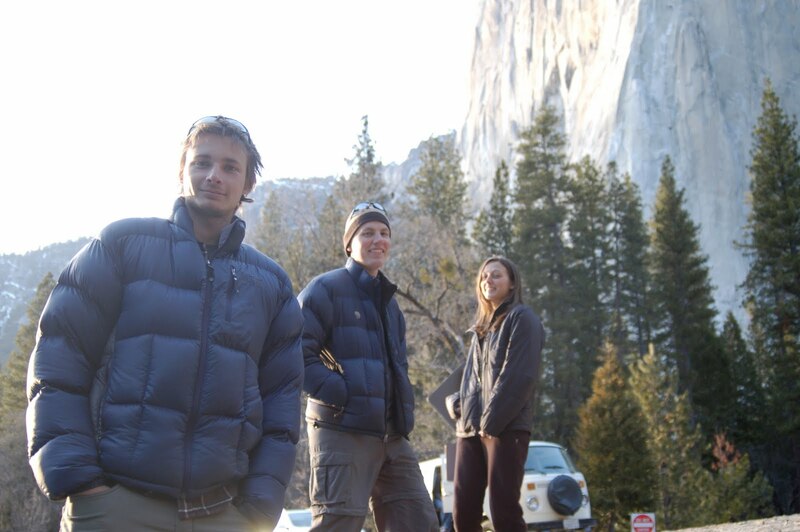 We swung leads; Nick led the first pitch (5.9), I led the second (5.10b), Nick the third (5.10a) and I led the last (5.10a). It was great fun—and it was Nick’s first multi-pitch route. In the car on the way back from the Borgeau Slabs we saw a Grizzly bear with three cubs--it was amazing! Check out the "wildlife sightings" page. From Boulder we drove to Lander, Wyoming. 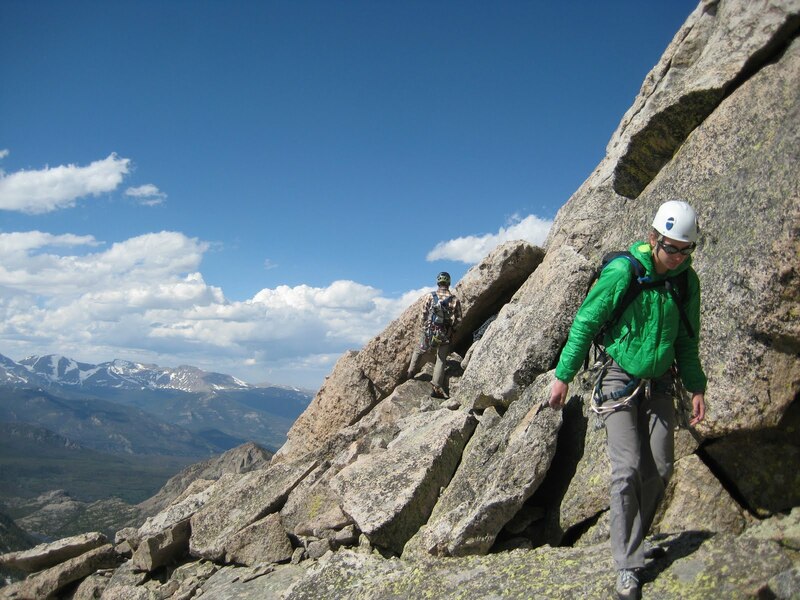 I was not familiar with Lander before we arrived, but I was excited about climbing peaks in the nearby Cirque of the Towers, hoping for routes similar to the one we had taken up Spearhead in Rocky Mountain National Park. However, after speaking with a guy at Lander’s climbing shop, we were convinced that due to the unusual amount of snow they had received this past winter the towers would be inaccessible without crampons and ice axes (which we don’t have with us). But Lander turned out to be a sport climber’s paradise—within an hour from town there are said to be close to two thousand bolted climbs. We spent a day exploring the crags at an area called Wild Iris—it’s higher elevation provided a refuge from the particularly hot day below. We spent the next day at the Main Wall of Sinks Canyon. Matt I challenged himself on some 5.12b’s and Matt II on some 5.11’s. While I can cleanly climb routes of higher difficulty on top-rope, by leading mentality is not quite at the same level as my technical ability—I was quite happy with the 5.10c that I did (although I admit that I hung on the last quickdraw for a particularly long time while I contemplated the moves I would have to make on the more run-out jaunt to the anchor). We easily could have entertained ourselves for quite awhile here, but we continued on in order to meet up with Nick in Alberta tomorrow. After only a couple of hours of driving from Lander, the Tetons came into view, and I felt that tingle that comes with witnessing something beautiful. They looked more jagged than the rest of the Rockies; I thought they had a somewhat similar aesthetic to the peaks I had seen in Patagonia. As the peaks in Patagonia are the youngest in the Andes, the Tetons are the youngest in the Rockies—perhaps the similar looks comes from the fact that they have had similarly relatively less time to erode away. After a night in Grand Teton National Park, we continued on to Yellowstone. We stopped to watch Old Faithful erupt and to observe the many bison that lazed along the road. In the afternoon we went on a hike and caught sight of a black bear. And the copious amount of snow that may have prevented my schemes of peak-bagging allowed for a particularly striking wildflower season this year. I knew that Yellowstone was the first national park in the U.S., but I didn’t realize exactly how important it was for the precedent of species preservation. Even after it was established as a national park, poachers were allowed to nearly wipe out its bison population, and did wipe out its wolf population. It wasn’t until bison were fully protected in Yellowstone that a population had the opportunity to thrive on a small sliver of land—Yellowstone was the only place that North American bison were never fully exterminated. The wolf population was rehabilitated after Canadian relatives of Yellowstone’s original population were introduced to the park in 1995. It’s amazing that in such a short while Yellowstone is now considered one of the best places to be able to see wolves in the wild. On Saturday Matt, Kevin, and I got a taste of alpine climbing on Spearhead, in Rocky Mountain National Park. 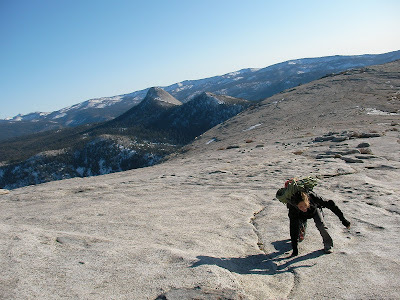 It’s 12,575-foot summit stands above an 800-foot granite face; while it looked intimidating from a distance, once we made the 6-mile approach (made particularly long by the unusual amount of snow still left on the ground), the north ridge revealed the obvious moderate route up to the top. Because the approach took us longer than we had expected it to, we quickly racked up at the base and got on the wall—Matt led the first pitch. After the first pitch, the climbing was particularly easy, so we decided to simulclimb up to the start of the last pitch. This was really my first experience simulclimbing—it was so efficient, and nice to not have to deal with managing the rope or taking the time to belay on every pitch. Kevin took the lead, placing nuts and cams for protection; I was in the middle and would unclip the gear from the rope in front of me and clip it into the rope behind me; Matt followed behind and pulled out the gear. We had nearly perfect weather (only a bit blustery as we got higher), and we had amazing views of Glacier Gorge below us the whole way. 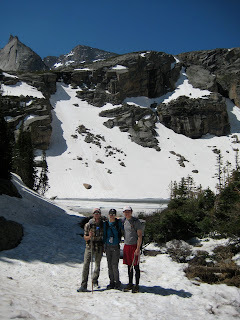 We finished the route around 4pm, then scrambled down the fourth class descent back to the snow. The snow was now very slushy, which made for faster travel but for very wet feet. We made it back to the car around 8:30 pm—about a 12-hour day. 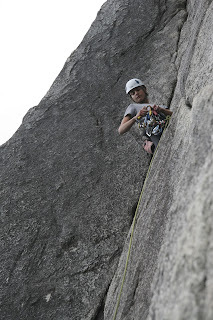 We took a more leisurely day on Sunday—all four of us went cragging at an area called Jurassic Park. It had beautiful views and a lot of fun, slabby sport routes. We’re now back in Boulder—Matt and Kevin went to climb the famous Bastille Crack in Eldorado Canyon, while the other Matt and I decided to stay in town (to blog, etc). Kevin has to head back to California this afternoon, while the two Matts and I plan to drive up toward the Wind River Gorge in Wyoming tomorrow. The last few weeks moved just as quickly as I supposed that they would. Some of highlights of what’s gone on since then include: a surprise meeting with Namgel Sherpa and Thundu Sherpa (Namgel came to the summit of Everest with me and Thundu went with my teammate Wim), Stanford graduation and moving out of my co-op, a train ride with my family from San Francisco to Colorado, my brother’s wedding in Telluride, and reaching the summit of a fourteener with my dad (Mt. Sneffels in the San Juan mountains). Whoa. 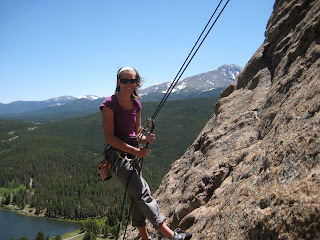 Now onto summer, and the previously mentioned sweet climbing plans. I’m going to spend the whole summer with some friends in a Honda CRV, visiting some of the best rock-climbing spots in the western US and Canada. Trad, sport, or bouldering—we’re going to dig into it all, and experience life on the road. Matt, Matt, Kevin, and Nathan—the initial crew—met up with me in Telluride after they had road-trip across Nevada and Utah. They were intent on climbing along the way but were somewhat held back by the heat. More from them later. On Tuesday the five of us started to drive towards Boulder . 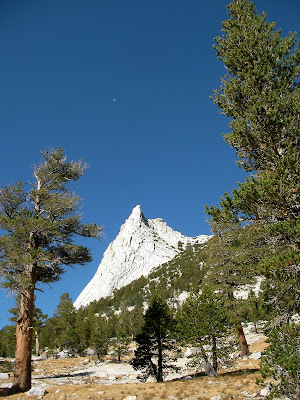 . . but once we realized that we were going to drive right past Rifle, one of America’s best sport-climbing destinations, we had to stop. 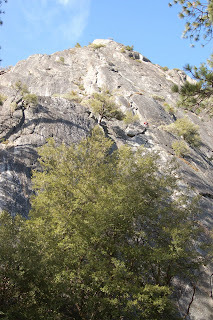 We climbed some of Rifle’s easier routes while we gawked at the number of people there climbing 5.13’s. Even if most of the routes were too hard for me, it felt so good to be climbing again! Maybe we’ll have to return at the end of the trip . . .
We made it into Boulder on Wednesday (yesterday) morning and met up with a friend who showed us some really nice boulder problems near the Flatirons in Chautauqua. Today Nathan had to go back home—after dropping him off at the bus station the rest of us headed into the grand Eldorado canyon. Kevin and I warmed up our trad skills by climbing “The Wind Ridge”, a really fun three-pitch 5.6 on the Wind Tower, while the Matts climbed Blind Faith (5.10) across the way. An amazing place . . . there’s so much more here I want to climb! Tomorrow we’re heading to Rocky Mountain National Park. I’ve handed in my senior thesis and there’s just a week and a half left of classes before finals period. Time feels to be going too fast. I’m excited for the summer (and for sweet climbing plans, details to come), but I’m going to try to savor these next few weeks as best I can. To me, bouldering is really about savoring the good stuff. Topping out on a boulder problem feels good, but it’s not exactly on the same level as reaching a summit after weeks of masochism. 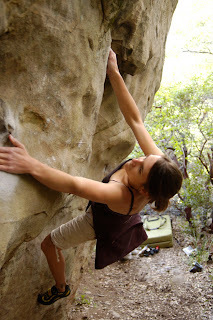 Bouldering is about working particular hard moves and savoring the movements of climbing; it’s a little bit less about the goal than about the process. 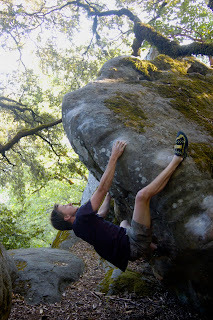 On Saturday the Matts and I took a daytrip to our local classic bouldering scene, Castle Rock. Some of the formations here seem too good to be true—the honeycomb pockets in the sandstone, formed when water seeps through and dissolves mineral grains, make for perfect climbing holds. 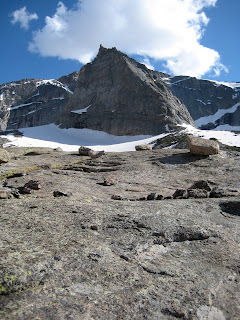 We went to a less-visited area that we hadn’t explored before—the Klinghoffer boulders. 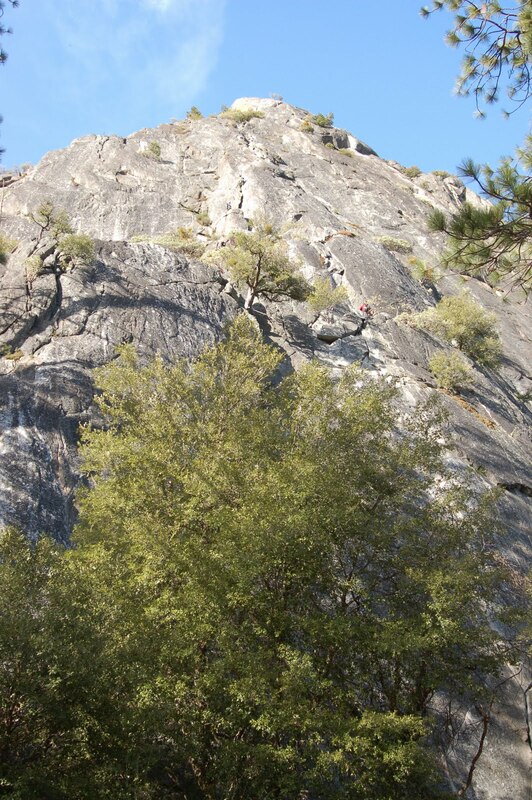 Here Matt I topped out on “Right Hand Man” (V7) while Matt II and I worked on the awesome "Klinghoffer Traverse" (V5). A fun afternoon, it set the perfect pace of how I’d like to experience the rest of the quarter. 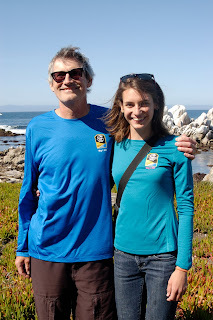 My dad and I are getting ready to run the Big Sur marathon on May 1! This will be my second marathon, but my first big road one (I ran a trail marathon in the Golden Gate headlands last year, with about 30 other runners). 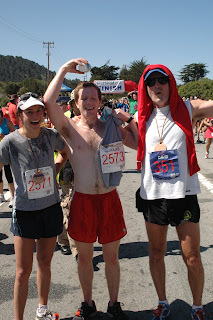 My dad, on the other hand, is a marathon veteran. While I was already to the point of tapering down my mileage, after peaking with a 20-mile run a couple of weeks ago, he ran the Boston Marathon yesterday. He finished in 3:32:17. Congrats! It feels strange that I won’t run more than eight miles before then, in order to give my body a chance to fully recover from the long runs I’ve already put it through. It’s a gorgeous route, although unfortunately a big portion of it has changed due to a collapse in part of highway one after our big rain. It’s now an out-and-back race, rather than a straight shot from start to finish. Still, the route hugs the coast the whole way, moving us along rolling hills. I’m excited for it! I spent most of spring break around Bishop, CA. 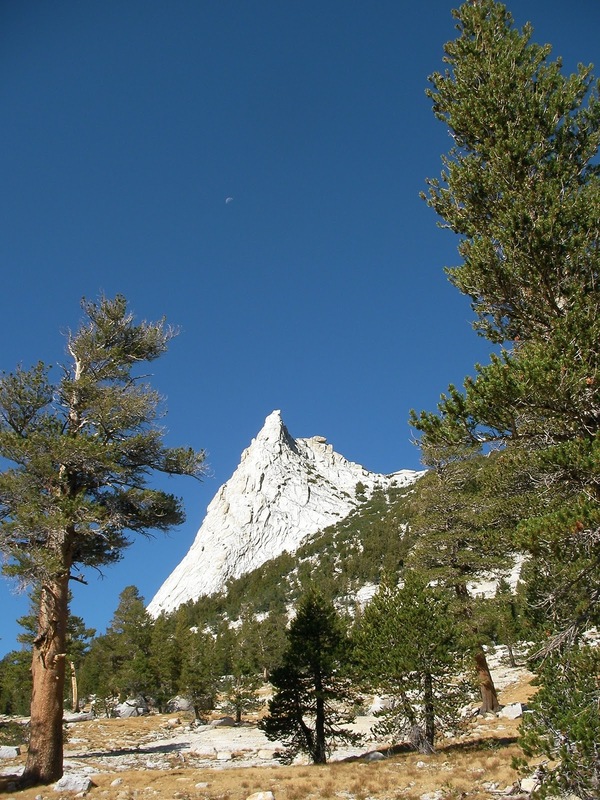 Situated in a valley with the Sierra Nevada to the east and the White Mountains to the west, Bishop offers some amazing scenery as well as world-class climbing. This was my first trip to Bishop, and I certainly found it lives up to its reputation. Unfortunately we didn’t have the best weather—a couple of storms came through—but even the worst day still allowed for a short bouldering session in the morning before the rain hit, and we had a day of perfect sun in Owens River Gorge. 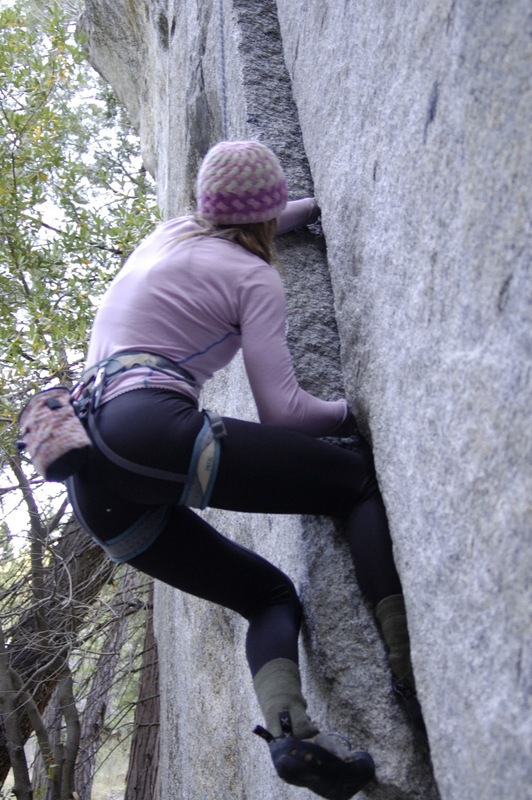 Our first climbing ventures were at the Happy Boulders. We spent a couple of hours there before sunset on the day that we arrived, and a couple of hours the next morning before it started to rain. The boulders here formed from a huge volcanic eruption about 760,000 years ago that spewed out ash over an area more than 2,200 km2. This rock forms all kinds of cool pockets and flakes that make for really fun bouldering. 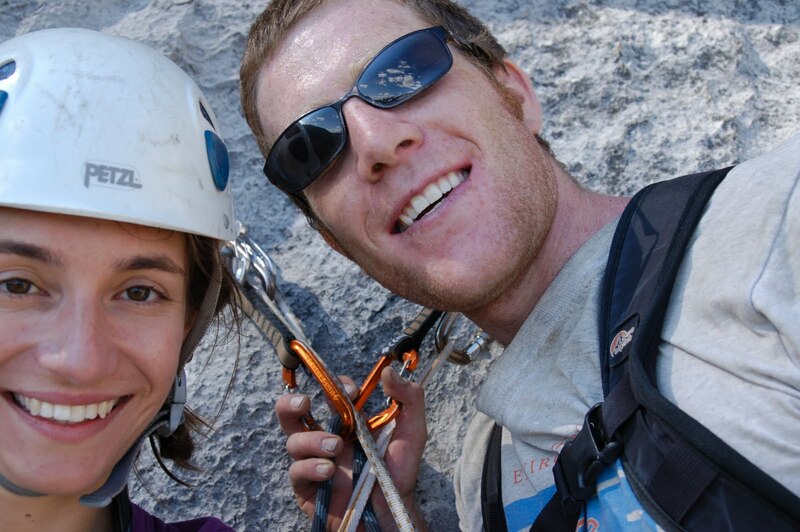 The weather the next two days was quite a bit better—we spent them sport climbing in the Owens River Gorge. 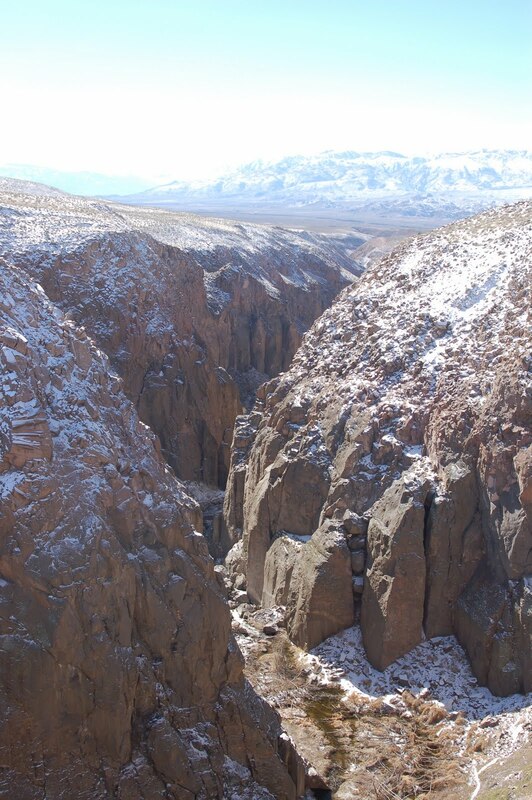 The Owens River carved out this steep gorge through the volcanic tableland (on which the Happy Boulders sit). It is at the center of a still heated debate, as the Los Angeles Department of Water and Power bought the land in the early 1940s for the water rights and constructed the Long Valley Dam in 1941, leaving the gorge completely dry from 1953-1991. In a way this led it to become one of the first sport-climbing areas in the country. 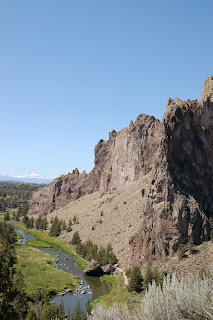 As the gorge already had a history of notable human impact when it became a popular climbing spot, its climbing pioneers felt less controversy over the ethics of drilling bolts into the rock. The genre of sport climbing relies on fixed bolts, which are more secure than traditional climbing gear (such as cams and nuts) and allow the climber to more safely try difficult routes on which he is more likely to fall. 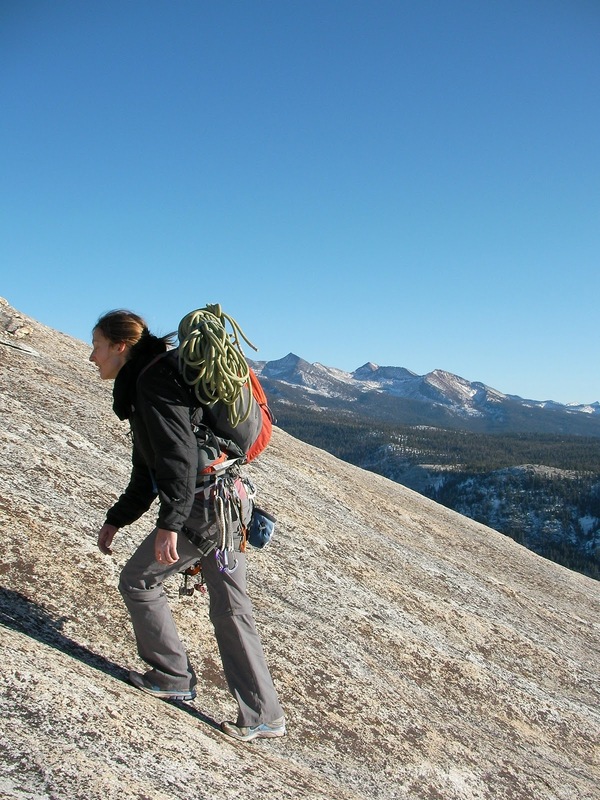 Our last day we tried out what is probably Bishop’s most famous climbing area: the Buttermilks. The rock here was quite different from the Happies or the gorge. 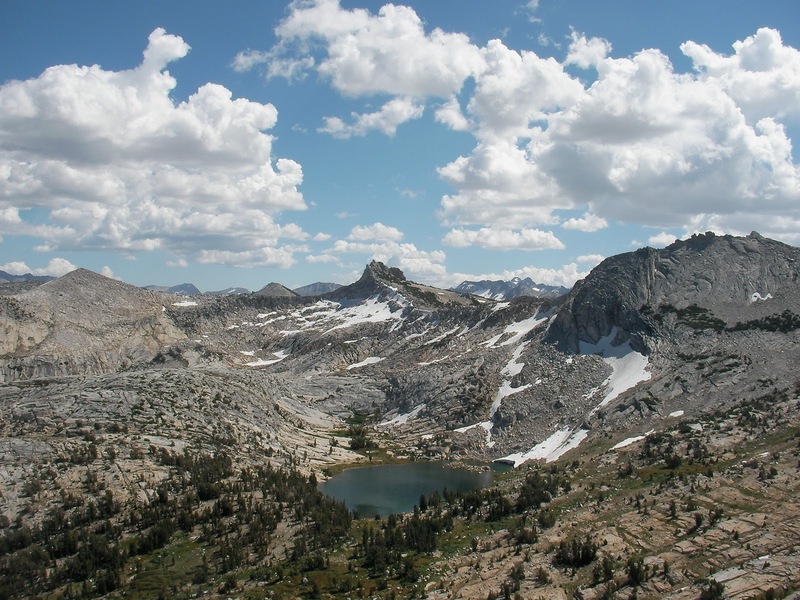 The area was a glacial moraine coming off from the Sierra Nevada—the climbing is on large granite boulders that were once glacial debris, dropped off from the higher mountains. It felt like a huge, beautiful playground. 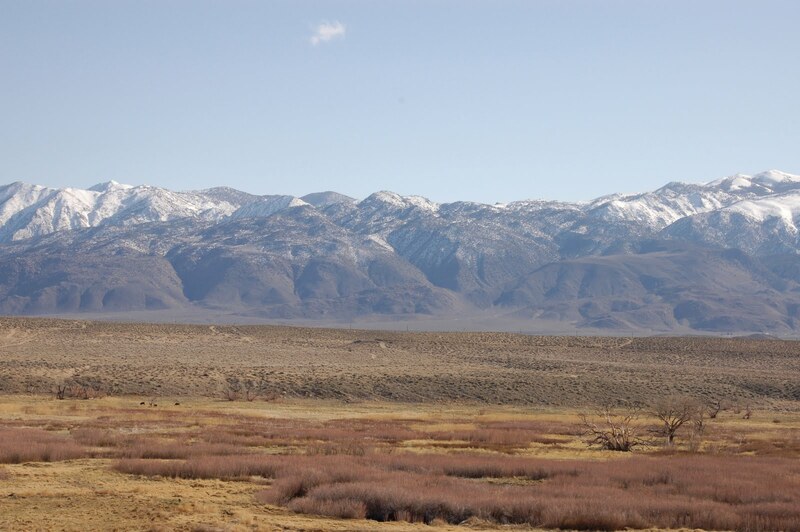 We left with still so much to explore—at all three areas we went to as well as the other quality sites around Bishop! 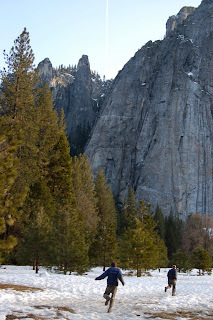 I had a really great time in Yosemite Valley last weekend. It’s still a bit early in the season—which did us well in that it kept a lot of the crowds away. But while there was still snow on the ground, the temperature felt perfect hovering in the low 60’s during the day. And it was completely blue skies on Saturday. 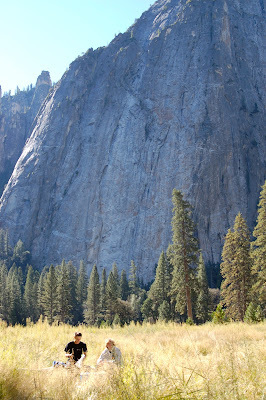 I’ve taken a few trips to Yosemite by now, but I still find the valley completely breath-taking. I can’t help but glue my forehead to the window on the drive into the park. It’s no wonder that it holds such an immense role in the history of US national parks (as well as the history of climbing). 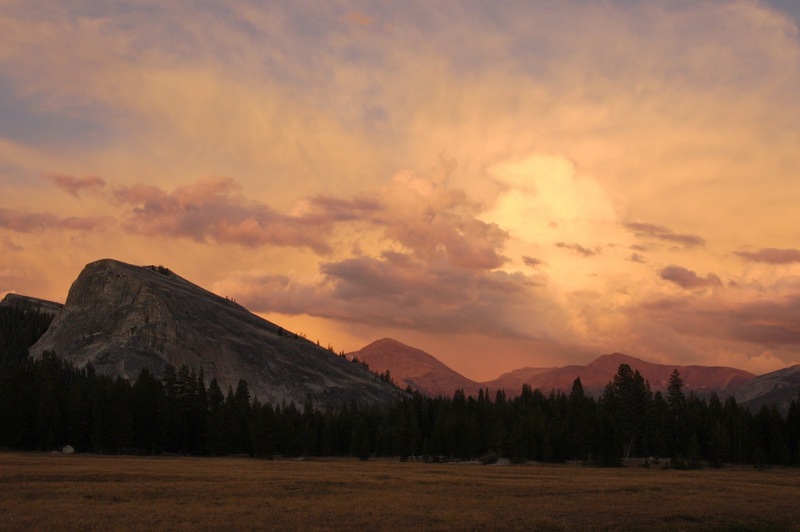 The first step towards the everlasting protection of Yosemite, as well as the first precedent of the preservation of land for public use, was in 1864 when President Abraham Lincoln signed a bill that created the Yosemite Grant. This paradigm allowed for the designation of Yellowstone as the world’s first national park in 1872. The renowned John Muir—explorer, naturalist, and activist—advocated for Yosemite to receive the same official recognition, which it did in 1890. I think the establishment of these national parks was vital to the ethos of the west—the concept of wilderness and a boundless frontier. While these concepts are somewhat loaded, and have undoubtedly changed, I’m glad that we have pretty accessible places to go to today where we can at least pretend to be in the wild. Saturday morning Matt, Brian, Anne and I headed to the Manure Pile Buttress. 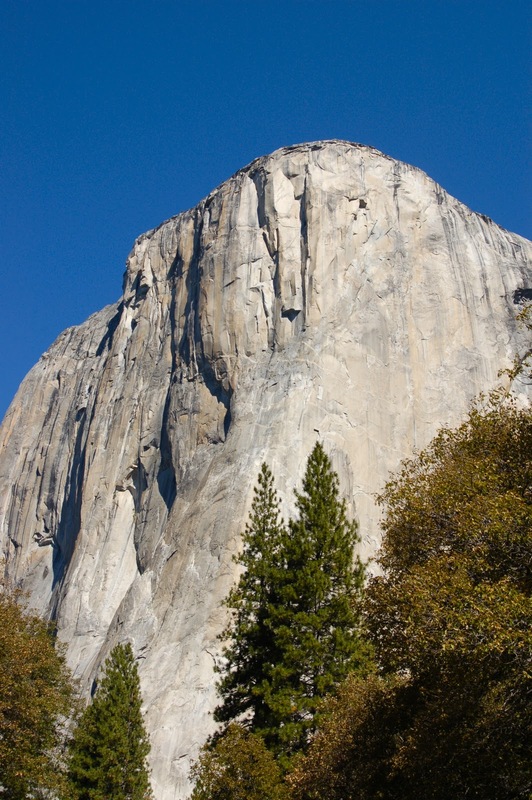 It’s not as unappealing as the name might lead you to believe—while it did once serve as the loading zone for horse dung, since 1965 when the route ‘After Six’ was put up by Yvon Chouinard and Ruth Schneider it’s become one of the more popular climbing destinations in the valley. Matt and I originally intended to do another route in this area called ‘The Nutcracker’, but we ended up climbing ‘After Six’ instead. 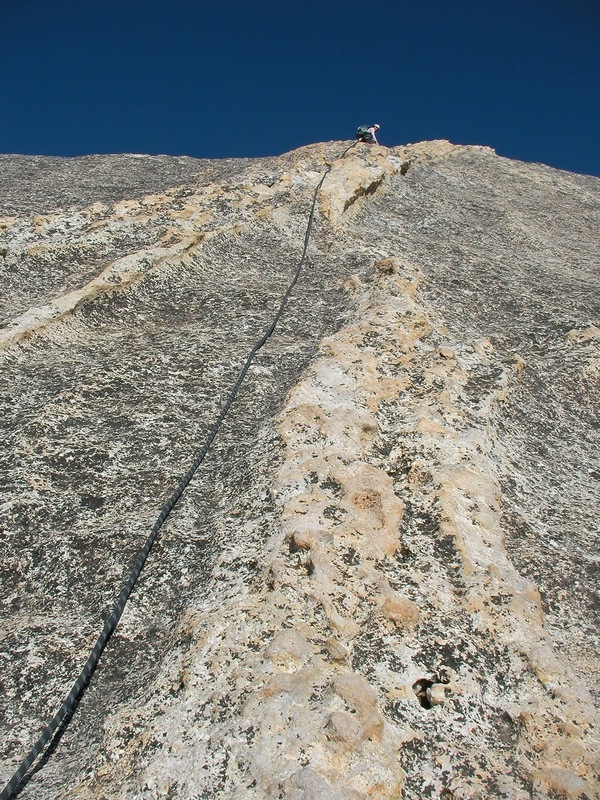 It’s five pitches (or rope-lengths) of really fun, easy climbing that got us 600 feet up off of the valley floor. I had an excellent time while climbing, and enjoyed belaying from its scenic ledges as well. We spent Sunday playing around on single-pitch climbs at the base of El Capitan. 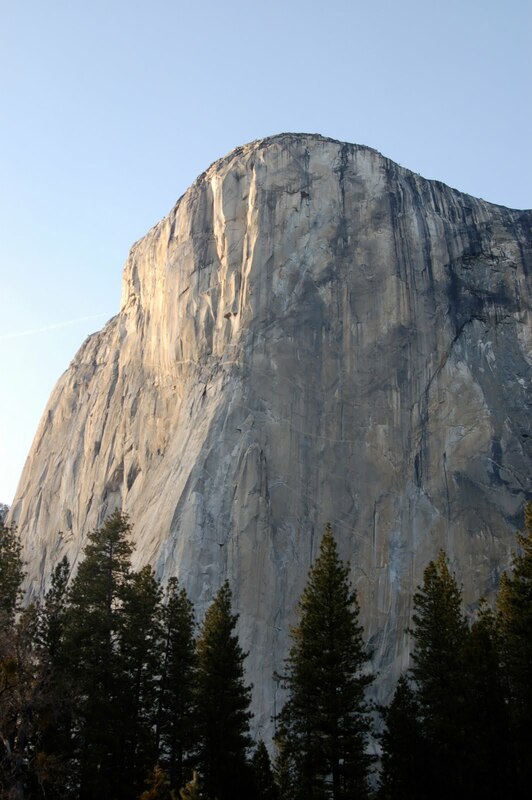 These routes didn’t take us as high, but it was fun to be able to look up at the rest of El Cap and all of its 3593-foot-high slick granite grandeur (I will admit to imaginations of how cool it would feel to be up there myself). We climbed ‘La Cosita, Left’ as well as ‘La Cosita, Right’ and the first pitch of ‘Sacherer Cracker’. It drizzled a little, which made the rock a bit slippery, but it was overall a fantastic day. After the four-hour drive back to Stanford I felt ready to go back to studying, but already excited for my next trip up off the valley floor.